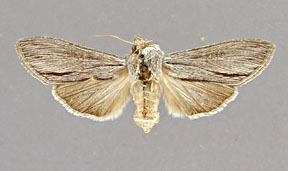 Copicucullia astigma Smith, 1894, Trans. Amer. Ent. Soc., 21:85, pl. 4, fig. 8. Copicucullia jemezensis Dyar, 1922, Ins. Insc. Mens., 10:167. Diagnosis: Cucullia astigma is a easily recognized species, although the male and female genitalia indicate a close relationship with antipoda and its relatives. The species is larger than others in the group and is characterized by a smooth, gray forewing coloration. 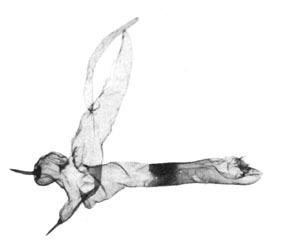 The only distinct forewing markings are the black inner margin, the usual black streak from the postmedial line to the outer margin, and a thin black basal dash running almost all the way to the postmedial line. There are two disjunct and distinct populations of astigma, one in southern California and the other in Colorado and New Mexico. The forewing is usually shaded with white in specimens from southern California. Both the reniform and orbicular marks are present, if not particularly distinct, in southern California. In contrast both marks are absent in Colorado and New Mexico specimens. The two populations may represent different species, but there is insufficient information at present to resolve the problem. 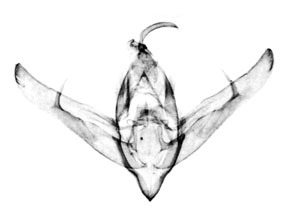 The male genitalia are like those of antipoda, but the apex of the valve is narrower and the corona reduced. The clasper is long and straight lacking the slight kink found, to varying degrees, in antipoda. 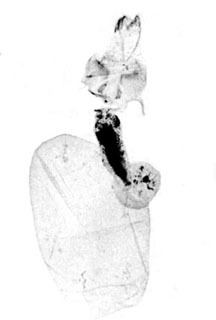 The female ductus bursae is longer and more sclerotized than that of antipoda. Wing length from base to apex (California): mean = 19.69 mm., standard deviation = 0.94 mm., n = 10. Distribution: This species is divided into two distinct and widely disjunct populations. The typical population is known from only a few localities; notably Garfield County in Colorado and Jemez Springs in north central New Mexico. The forewing is uniform medium gray and the reniform and orbicular marks are absent. 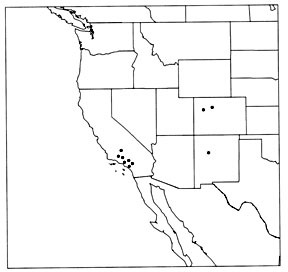 The second population occurs in southern California. The forewing in this population is usually shaded with white. The reniform and orbicular marks are both present, although neither is particularly distinct. The valve of the male genitalia is slightly shorter and narrower than that of the Colorado-New Mexico population. The southern California population appears to live in the mountains. It is known from the San Bernardino and San Gabriel Mountains in the Los Angeles region, northward in the Tehachapi Mountains through Kern County to southern Tulare County. Larva: The larva has not been described. Foodplants: The larvae of this species has been reported to feed on Corethorogyne filaginifolia and Haplopappus squarrosus by McFarland (1975) under the name jemezensis. Both plants are shrubby composites. McFarland (1975) states that the larvae tend to predominate on one foodplant species or the other in sucessive years.